South Korea must address its inactive share of academics for sustainable growth. Compared to problem stricken countries like Spain or Greece, youth unemployment in Korea doesn’t seem to be an issue. Official OECD statistics report an unemployment rate of 9,6% for people between 15 and 24 (Jones 2013). With respect to this low rate of unemployment South Korea is outperformed by only very few countries like Germany and Switzerland, which have youth unemployment rates around 8% to 9%. This picture, however, changes dramatically for the number of NEETs (youth not in employment, education, or training), as presented in Figure 1. 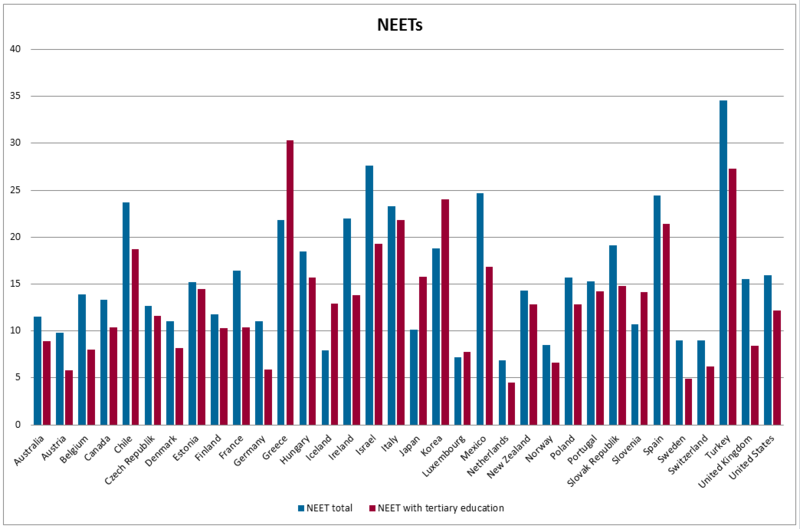 According to recent OECD (2013) educational data, NEETs made up 18.8% of the population in 2011, a rate also experienced in countries like Spain, Greece, or Italy. Interestingly, this number is not driven by people with low educational background, but by people with tertiary education. NEETs with tertiary education make up 24%. Only Greece and Turkey have higher shares in the group of OECD countries. Such a high share of inactive, young and educated people is worrying from an economic point of view. They don’t contribute to the economy by delaying labour market entry, but enjoy a very expensive education, placing huge debt burden on their families. Overall, Koreans spend 7.6% of their GDP on education, of which over one third is paid for by private households (OECD 2013). Youth (15-29 years) not in employment, education, or training as percentage of total youth. Why is such a high proportion of young Koreans inactive? The three main causes, which are also interconnected, are (1) a lack of jobs due to decreased international competitiveness and recessions, (2) a lack of flexibility on the labour market, and (3) a skills mismatch (see Schmid 2013). Regarding academics the skills mismatch i.e. over-education is most prevalent. Almost 86% of all high school graduates attend colleges in Korea, as a tertiary degree is regarded as a ticket to success in Korea’s competitive society. 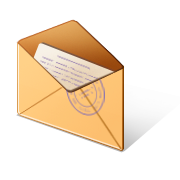 It is said to guarantee social recognition and a high income. The Samsung Economic Research Institute (SERI) (2012), a private think-tank, however, estimated that around 42% of college graduates are over-educated for the labour market. Korea is lacking skilled technicians and craftsmen, not academics. If these 42% would enter the labour market right after high school, the economic growth would be 1.01 percentage points higher, according to SERI. This growth is vital for an economy like Korea with a miracle growth in the past and projected low growth rates due to a lack of competitiveness and a shrinking society. Therefore the last Korean President, Lee Myung-bak introduced “Meister schools”, vocational high schools for talented youths copying parts of the successful vocational training system of Germany and Switzerland. But Korea needs more than just another elite institution increasing the competition among students. The government needs to address the competitiveness in Korean society first to make vocational education a more viable option. It must be okay for high schools students not to go to college. They should be able to pursue their dream job and not society’s dream jobs. This may also mean to share wealth through a bigger welfare system, which makes less paid jobs more attractive for high school graduates.